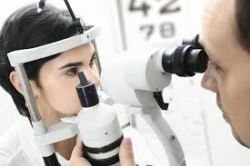 An eye movement test to assist diagnosis of major adult psychiatric disorders has been devised by researchers from the University of Aberdeen. The test recognises unusual eye movements to help clinicians identify illnesses such as schizophrenia, bipolar disorder and severe depression. It is hoped the assessment will make the process of reaching an accurate diagnosis more efficient. The plan to commercialise the test for use in mental health care worldwide will compete against five other finalists in the 2013 Converge Challenge Awards on September 24, for the first prize of £60,000. Dr Philip Benson, a senior lecturer in Psychology and one of the academics behind the test said: "Delivering an accurate and timely diagnosis remains one of the most pressing responsibilities of modern psychiatry. There aren't any objective diagnostic tests available to routinely validate decisions made by clinicians. "It has been known for over a hundred years that individuals with psychotic symptoms are unable to smoothly track slowly moving objects with their eyes. Their gaze tends to lag behind the object and then catch up with it by making rapid skips called saccades. Professor David St Clair, Chair of Mental Health at the University of Aberdeen and a consultant psychiatrist at NHS Grampian said: "Our test will help clinicians arrive at an informed diagnosis much sooner and reduce the time patients spend in clinics. This will mean they receive appropriate treatment sooner too, helping them resume a more normal life. We believe the test may also have the potential to identify individuals who are at risk of developing mental health problems before they arise." Supporting the academic team to address the many challenges in delivering this type of assistive tool into the broad sphere of global healthcare is Mr Madhu Nair, a technology entrepreneur and Satire Fellow with experience in developing early stage opportunities in the software and life science sectors both in the UK and US. Mr Nair said: "Our simple eye movement tests can recognise schizophrenia and other major psychiatric disorders with better than 95% accuracy and within 30 minutes - a step change for psychiatry. The need is significant with 1 in 5 adults suffering from some form of mental ill health during their lifetime and 5% developing major psychiatric disorders. A staggering US$2.5T is spent annually due to mental ill health which is the largest cause of disability worldwide."